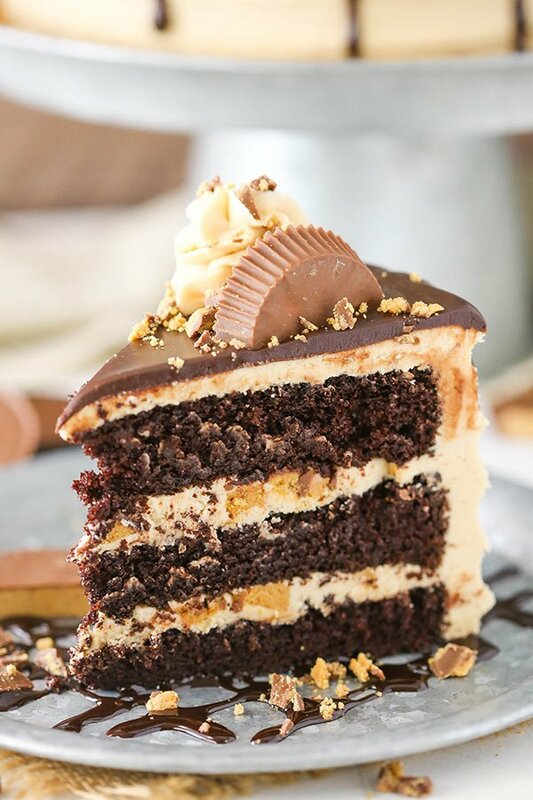 Peanut Butter Chocolate Layer Cake + Reese's Peanut Butter Cups! 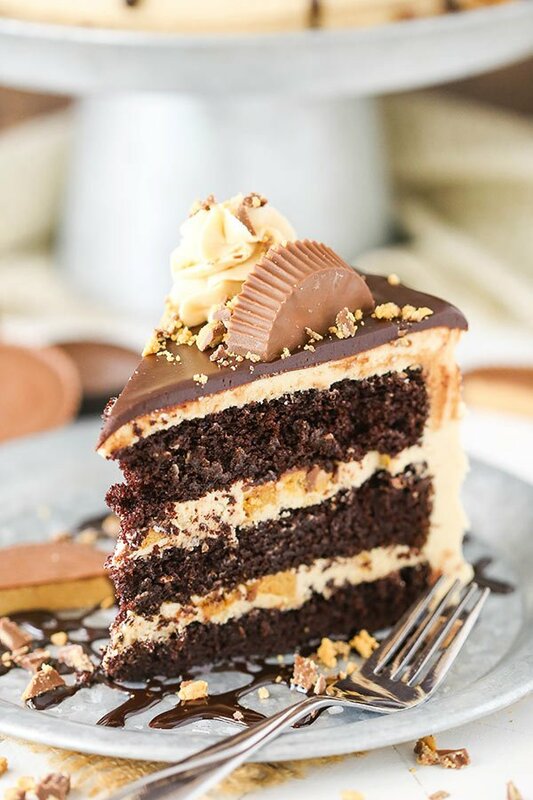 This Peanut Butter Chocolate Layer Cake recipe is made with layers of moist chocolate cake, peanut butter frosting and chopped Reese’s! It’s rich, delicious and so fun! While taking some photos yesterday of a cake, I was reminded of something that the hubs regularly tells me and demonstrates through fearful looks my way – I am one photo away from seriously injuring myself. One of the tables, counters or chairs I stand on to get just the right angle will one day not cooperate the way I want and I will fall and either break the camera I’m holding or some part of my body. It’s bound to happen. I have a three step stool that I use all the time for overhead shots or something that’s at a more dramatic angle than I can achieve just by standing. Yesterday, I was standing on that stool taking photos and teetered and tottered a bit while stepping down from the top stair. Then I was in the kitchen taking some photos and didn’t feel like walking to the other room to grab the step stool so I grabbed a chair. I stood on the seat and started to sit back on the back rest to get the angle I wanted and suddenly realized I was starting to tip backwards. Luckily I realized it before it was too late and caught my balance. I was dangerously close to falling back into the wall and onto the dog bowl stand (with sharp corners). Who knew food blogging carried such job hazards?! Not to mention the extra calories that come along with it. 😉 I suppose it’s worth it when I share cakes like this one. I’m so in love with it! The cake starts with moist, delicious layers of chocolate cake. I used my Easy Moist Chocolate Cake from a couple weeks ago in layered cake form. It truly is such a moist cake and so easy! You basically mix the dry ingredients, then wet ingredients, add them together, then add the hot water at the end. One of the quickest cake batters to make and hard to mess up. 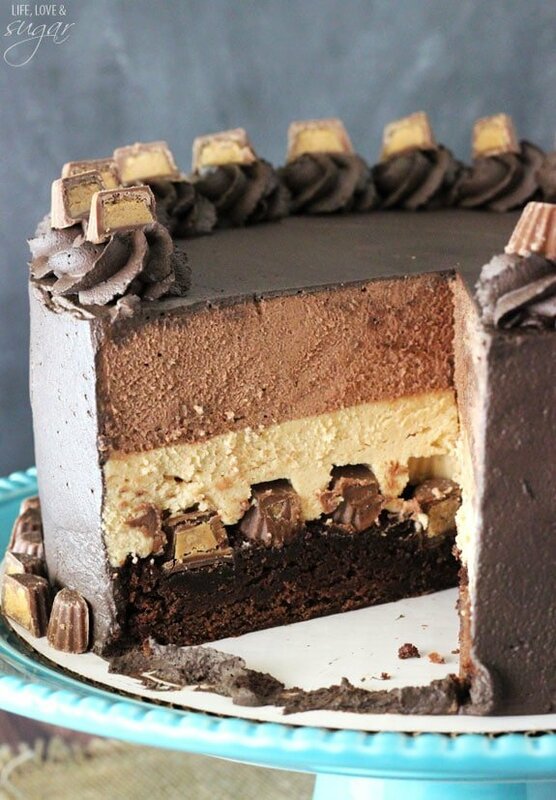 Between the layers and covering the outside of the cake is a peanut butter frosting. 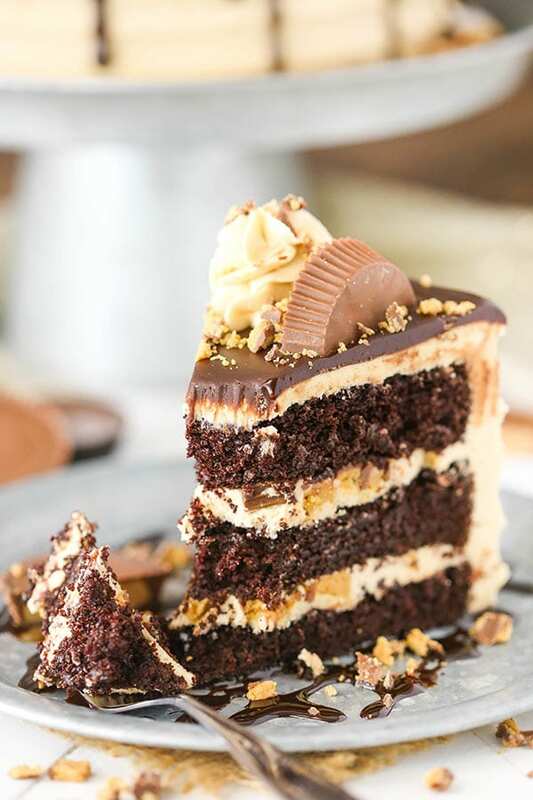 On top of the frosting between the cake layers are also chopped Reese’s – every peanut butter and chocolate lovers favorite, am I right? They take the peanut butter flavor up a notch and I’m a fan. After the cake is covered with frosting, ganache is drizzled down the sides and covers the top. The stripe pattern on the sides of the frosting creates a neat ripple effect in the drizzled ganache. Then I added more Reese’s and frosting – for good measure. 🙂 The final cake is not only delicious, it’s SO fun! I was in love with the look of it! If you’d like to recreate the same thing, check out the video just above the recipe to watch what I did. 1. Preheat oven to 350°F (176°C) and prepare three 8 inch cake pans with non-stick baking spray and parchment paper in the bottom. 6. Divide the batter evenly between the prepared cake pans and bake for 22-25 minutes, or until a toothpick comes out with a few moist crumbs. 7. Remove cakes from oven and allow to cool for 2-3 minutes, then remove to a cooling rack to finish cooling. 8. To make the frosting, combine the butter and peanut butter in a large mixer bowl and mix until well combined. 10. Add 3 tablespoons of water or milk and mix until smooth. 12. Add remaining water or milk and mix until smooth, keeping an eye on the consistency of the frosting so it doesn’t get too thin. 13. To build the cake, use a large serrated knife to remove the tops of the cake layers so that they’re flat. 14. Place the first cake layer on a serving plate or cardboard cake circle and top with about 1 cup of frosting. Smooth frosting into an even layer. 15. Add about half of the chopped Reese’s on top of the frosting and press into the frosting. 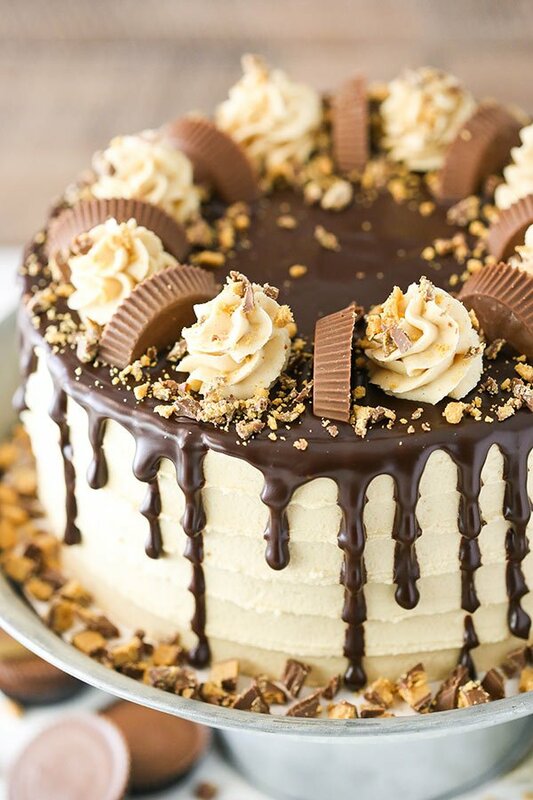 Spread a small amount of frosting on top of the Reese’s so that it’s sticky on top for the next cake layer. 16. Add the next cake layer and top with about 1 cup of frosting. Smooth frosting into an even layer. 17. Add remaining half of the chopped Reese’s on top of the frosting and press into the frosting. 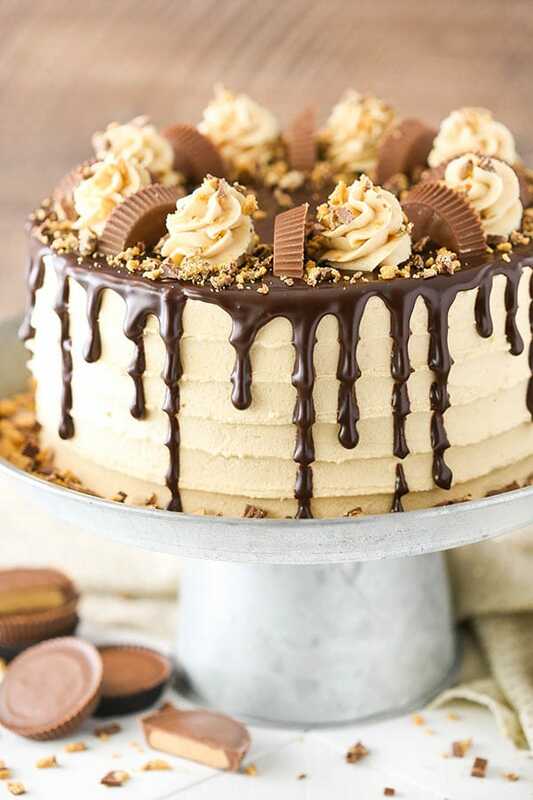 Spread a small amount of frosting on top of the Reese’s so that it’s sticky on top for the next cake layer. 18. Add the final cake layer to the top of the cake. 19. Smooth out the frosting on the sides of the cake, creating a thin crumb coat. 20. Add about 1 cup of frosting to the top of the cake and smooth into an even layer. 21. Frost the cake using my tutorial for a smooth cake. Stop just before using the paper towel, which won’t be necessary with the pattern on the sides of this cake. 22. Use an offset spatula to create the stripes around the cake. For guidance, see the video above starting at about 1:40. 22. Set the cake aside and make the chocolate ganache. Put the chocolate chips in a heat proof bowl. 23. Microwave the heavy whipping cream until it just begins to boil, then pour it over the chocolate chips. Allow it to sit for 2-3 minutes, then whisk until smooth. 24. Use a squeeze bottle or a spoon to drizzle the chocolate around the edges of the cake, then fill in the top of the cake and smooth it with an offset spatula. 25. Allow the ganache to firm a bit, about 10 minutes, then top with remaining frosting, additional Reese’s chopped in half, and Reese’s crumbles. 26. Refrigerate the cake until ready to serve. Serve at room temperature. Cake is best for 3-4 days. Wow!! This looks amazing!!! I love all the videos you have been posting lately!! Thank you so much!! The things we do for our blogs. 🙂 Thanks Melissa! Gorgeous cake, gorgeous video… Thanks so much for sharing!!! Another amazing cake from your kitchen with terrific photos. The things we do for food blogs!! This is a fabulous cake! Thank you for your video tips, too! Lindsay, this cake was fabulous! I made it for my Bible study tonight and everyone loved it. Some even said it was the best cake they’ve ever tasted. I had some trouble with the frosting being too thick, but I think I should have just added more milk. Also, do you have any tips for creating the stripes? I think my problem was my frosting was too thick, so my offset spatula had a hard time gliding on the frosting. Awesome! I’m so glad everyone enjoyed it! 🙂 You are correct that it probably just needed more milk. I find peanut butter frosting tends to be drier than others so I usually add a little more moisture than usual. And that was most likely the issue with the stripes – you are right on. 🙂 With it being dry, it’s hard for the the spatula to move the frosting smoothly. Love your beautiful cakes! Really enjoy all of your blogs! Is there a particular reason you chose this chocolate cake recipe over your Best Chocolate Cake? Would they be interchangeable or are the flavors more suitable for this recipe combination? Thanks again for sharing!! Thanks Lysa! Both chocolate cakes are terrific. I have found that some people are thrown off by the slow bake version (Best Chocolate Cake) and the long bake time. This cake is just an alternative. They have similar flavors and textures. It’s hard to beat the Best Chocolate Cake, but this one’s pretty darn close. 🙂 You can definitely swap it into this cake if you wanted. BTW, the peanut butter frosting is to die for!!!! I did use this version of the chocolate cake and was thrilled with it! I do like the combination, and the hubs loved it! He does not like cake, until this recipe. Thanks! Awesome! 🙂 So glad you enjoyed it! Is this meant to say nine (9) cups of powered sugar? The grams say 1,035 but there are 3,060 grams in 9 cups. Just double checking. Trying this recipe as I type actually lol. It looks delicious! The measurements are correct as written. Here’s a conversion chart I recently put together showing a breakdown of the measurements I use. Hello! Can this be made with a Swiss meringue buttercream instead of an American buttercream? Thanks in advance! Yes, that should be fine. I haven’t worked with SMB a ton so I can’t say what recipe to use for it, but I would think it’d be fine to swap it out. Hi. Can you please tell me if the cocoa is sweetened or unsweetened? I haven’t made peanut butter before. I’d try to find a recipe online with the ingredients you have available. 3. Stand and take photos. The frosting is so sweet though, I couldn’t enjoy it. Did you use some salted butter in the frosting? I usually use half salted butter and half shortening. The salt cuts down on the sweetness and adds some flavor as well. Wondering if that’s what you usually do why isn’t that in the recipe? Does shortening refer to crisco? So half butter and half crisco in the frosting? Actually Kim, I was a little confused when responding to this comment. It can be confusing with so many recipes to keep everything straight. Most of my frostings use half butter/half shortening. When I use all butter (as I did in this one), I tend to use either half salted/half unsalted or just all unsalted and add my own salt. In this recipe, it specifically says that I used all salted, which is correct. And as far as sweetness goes, salt cuts down on the sweetness a bit. I made this cake for our January monthly office birthday lunch and it was a big hit! I usually make a different cake each month, but now I have been requested to make it again for our March lunch! 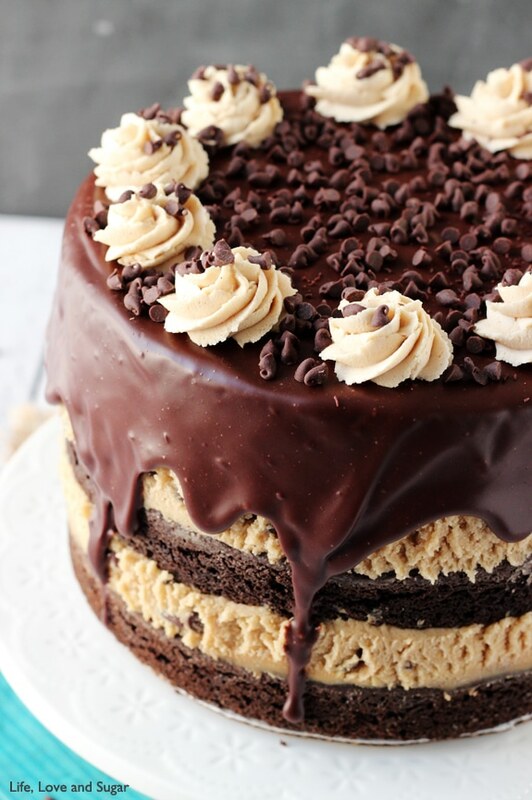 Can’t go wrong with Peanut Butter and Chocolate! I’m going to make this cake for my husband’s birthday. Can you tell me if you use natural peanut butter or a sugary brand – like Skippy? I always use a regular brand since natural brands can often separate. I only have 9″ round cake pans. Could I just do two 9″ rounds stacked?? How would the baking times differ? You can. I haven’t made this particular cake as 9 inch rounds, so I’m not sure exactly. I’d guess around 30 minutes. Made the cake for my super picky husband and he LOVED it! I am not a big chocolate cake fan but the cake was delicious! 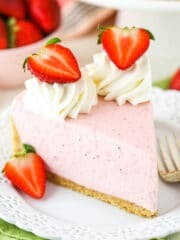 I was wondering if you have any strawberry cake recipes ? There are a few options, depending on what you’re looking for. Try this too :0) You can make it all year round. 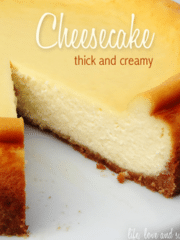 I’ve made this since the recipe was published and it’s always a hit. I made this as a birthday cake for a nurse I work with and it was a huge hit with the staff. Even the custodian asked if he could have a piece even though he is “not a cake person.” I have to say, I opted not to ice the sides of the cake, just between the layers and the top. The frosting is incredibly sweet and I think enough to cover two cakes in entirety! I will be making it again as I already have three requests for this cake! Awesome! So glad everyone enjoyed it! Lindsay, I have now made two of the cake recipes you have posted. This one, for my husband’s birthday tomorrow, and the “Mint Chocolate Chip Layer Cake” in February for my daughter’s birthday. Both have been/are amazing, so moist and delicious, with layers (excuse the pun) of flavor, and a perfect balance of flavor without being over the top sweet. Your instructions and tips, along with the videos have been so helpful. Thank you so much for the recipes and the terrific help in giving me the ability to show my family love through some pretty spectacular cake making. Keep up the great work. Thank you so much Joann! Glad to hear you’ve enjoyed everything! I loved this cake! Could I use the batter for cupcakes or is it too runny? Glad you enjoyed it! And yes, you can use it for cupcakes. Is the batter runny in general? How’s is the consistency supposed to be? Yes, the cake batter is quite thin. This looks amazing! I cannot wait to make this for my husbands 35th Friday this Friday!! I know he will love it! Hello! I’m making this cake this morning and was wondering if you let the butter for the icing get to room temp before using or if you use it cold right out of the refrigerator? Yes, room temperature butter in the frosting. This looks amazing! Love the video tutorial, too! I plan to make this next weekend as a sheet cake for a friend’s birthday. (Will bake 4 9×9 pans and lay the cakes side by side.) Do you think I should do 1.5 times the frosting recipe or double it? Thank you for posting, will definitely check out more of your cake recipes! Hmm, not entirely sure. It’s a fair amount of frosting, so if you’re just doing one cake layer, you might be fine with the amount listed. I made this cake this past weekend and it was a huge hit!! Thank you so much for sharing! And your video was so helpful. I made a sheet cake so I made 2 batches of cake, each with 2 9×9 square pans. I used a full 9×9 and laid about 2/3rds of the 2nd one next to the first (probably about 14 inches long total). 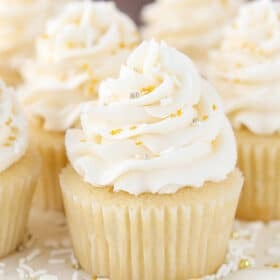 A few things to note that may help others… If you intend to double the recipe, the frosting makes a lot, so depending on your mixer size, you may need to make one batch twice. The frosting wouldn’t all fit in my kitchen aid mixer (from the 90s!) so I had to separate it. I used 7 cups of powered sugar instead of all 9 for one batch. For the two batches, I had 16 cups of frosting. I used about 12 cups total. Not sure what size frosting tip you used, but I know I used the largest one I had, maybe it’s a 2F? The smaller tips didn’t look right. Hope this helps! Thank you again for this awesome recipe and presentation!! Beautiful! I’m so glad you enjoyed it! Thanks for sharing your tips! I used an Ateco 844 tip – I definitely like my big piping tips! Can you use 2 9 in pans? Would baking time change? To prepare pans, you only cover the bottom with parchment paper and spray just the sides? No need to flour the pans? Do you recommend spraying the sides or using shortening to grease? Very excited to make this cake!!! The baking time would likely be similar, I’d just keep an eye on it. And no I don’t use flour, just parchment and baking spray. I use Bakers Joy brand spray. I hope you enjoy the cake! How long will the frosting last in the fridge after it’s made? I made so much I would like to use it on another cake in a few days. Thank you! Hi! Which piping tip did you use for the frosting decorations on top? This cake looks so delicious that I want to make two of them! I’m hoping to make one today and one next week. Do you think the cake and the frosting can be frozen and thawed? They should be fine to freeze, just make sure to wrap the cakes well and thaw in the fridge. Loved this recipe! This Is the first time I ever made a later cake and it turned out great! I only had 9 inch round pans and baked them for 30 minutes. they collapsed a little in the middle but we’re cooked all the way through and tasted great! The frosting was a little sweet for me but o think a 3rd layer of cake would have balanced it out. 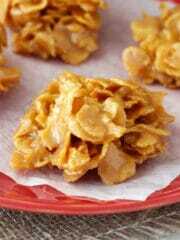 Thanks for such a delicious and easy go follow recipe. I got compliments all night! What sugar did you use? I made this last week for dessert for a dinner party. Everyone absolutely loved it and thought I bought it at a local bakery. I had some frosting leftover so today I am making cupcakes for a church bake sale, repurposing it. Thanks for the recipe. Hope you can see the photo. This is a real show-stopper! Hi Lindsay. I made this cake for my husband’s birthday and it was delicious! The frosting ended up drier than I hoped (the cake was still beautiful and frosting tasted great). I am wondering if you typically use milk or water for the frosting? And if milk, what percent? Thank you! I’m glad you enjoyed it! I usually use water since I prefer not to refrigerate the cake. Peanut butter frosting is one I’ve noticed can tend to be drier than others. You can always add a little more milk or water to help it along. Would the temperature and length of time change for cupcakes? Thank you. Should be roughly 15-18 minutes. 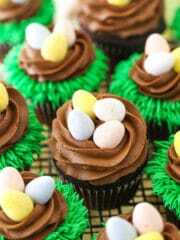 You could also check out these chocolate cupcakes. Beautiful looking cake, I cannot wait to give it a go. I’m planning on making this cake for a friend’s birthday this weekend. Would adding mascarpone to the peanut butter frosting work? I want to keep the peanut butter flavour, but not be too sickly as I like to use a lot of frosting! I’ve added mascarpone to frostings before, just not a peanut butter one. It should be ok, just be careful – over mixing mascarpone can make it watery. 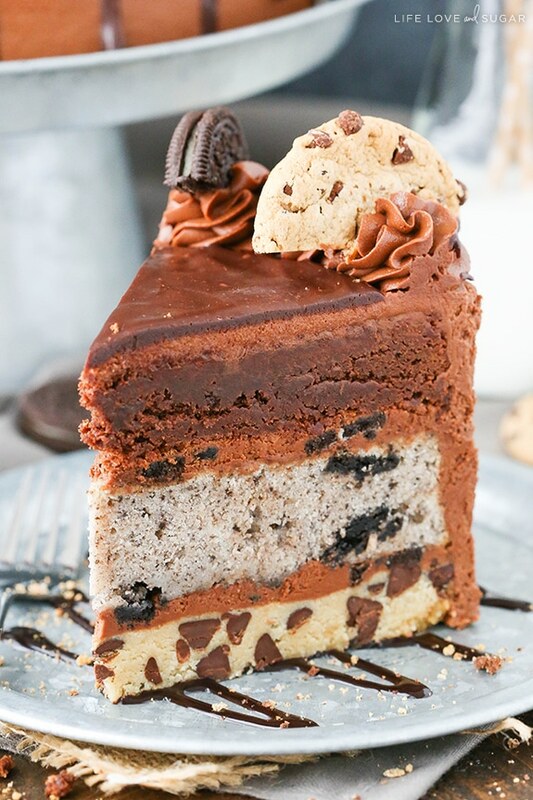 Can this be made as just a two layer cake? Three layers might be a little too much for me! Can’t wait to make this, though! Looks delicious. Yes, you’d just need to adjust the baking time. Thank you for this wonderful recipe, and decorating idea. I made this for my son’s birthday. The peanut butter frosting was absolutely marvelous. I put aside some for the pastry bag flowers and thinned the remainder and it was perfect. I did take short cut and used boxed cake that was too dry, so next time I’ll use your recipe for the cake. I have made this cake twice now and it was amazing! My very picky husband even asked for it again. Will be making it again. Thank you for the great recipe! Sure, they’d just be thinner cakes and not bake as long. I made this cake for a friends birthday and it was amazing! I have another friend wondering if I could make this but with a white chocolate cake. Do you know how I could go about doing that? I’m so glad you enjoyed it! I would say white chocolate in the cake layers would be tough to get the flavor to come through the same way. I might suggest swapping things around. 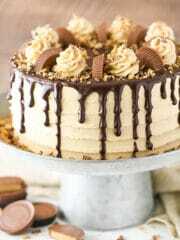 Such as making peanut butter cake layers with white chocolate filling/frosting. There’s a white chocolate mousse filling here you could try. You could also use a white chocolate ganache. I hope that helps! 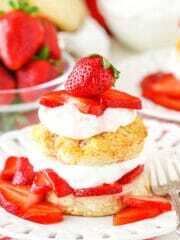 I love your blog and follow you and your wonderful recipes. I made this cake today and posted on Instagram with your hashtag!! Can’t wait to eat it!! All your recipes are awesome. I am not doing the Reese’s on top, instead I piped white chocolate to write out a message on the top. My question is, how would you recommend adhering the chocolate words to the ganache? Do you think it would be OK to lay down the letters after refrigerating 10 minutes? I’m afraid it will melt. I could wait until the ganache is completely set, but not sure what to use to attache the decorations (all wording). Thoughts? What kind of tips did you use to frost? Thank you!???? I used Ateco tip 844 for the swirls on top. This looks great! How long did this take to make you from start to finish? Thank you for sharing your recipes and cake design I made this tonight and it was a huge hit! I’ll never use a chocolate box mix again! Awesome! It’s a great chocolate cake – so glad you enjoyed it! I ended up making this cake for my son’s birthday because I couldn’t find chocolate peanut butter cake at any store in our area. I followed the direction and the cake turned out great! My son was in love with it and said it’s his favorite cake ever! I have to say that the frosting had a bit too much sugar for me. And I know that some people like it that way. I made this cake 3 more times and used less sugar in the frosting (2 cups less). And it still turned out perfect and very yummy. Thanks for sharing this recipe. Awesome! So glad to hear they enjoyed it! pictures indicate the frosting is an off-white color. However, my frosting was much darker. Also, cake layers thinner than those pictured in the video. cake layers had to cook 40 minutes. I plan to make the cake again. However, any suggestions for the issues I encountered? Not sure about the color. It could be the way the photos look, a difference in the settings on your computer screen or even something about the different brands of peanut butter. The frosting generally should be light, but be a little light brown like peanut butter. It would be hard for me to say about the cake layers without being there or having any context. The difference in cooking time could simply be a difference in our ovens. I made this cake last night for someone’s office farewell. It was a hit. 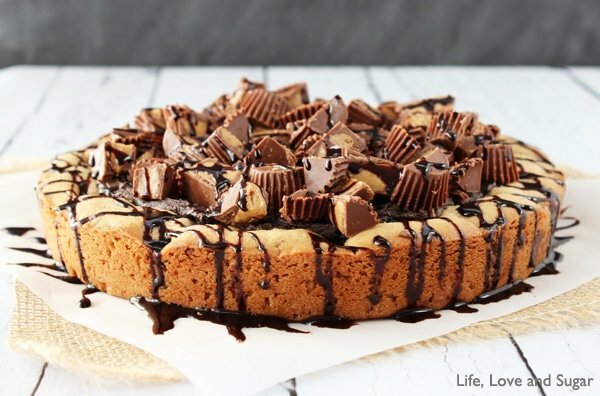 I chose this recipe because the guy who was leaving told me that he loves peanut butter and chocolate and also, Reese’s is his favorite candy bar. Well, as I was walking out the door at the end of the work day, he told me that this cake was the best cake he’s ever tasted. Mind you, I bring in desserts at least once a month so he’s had a lot to choose from. 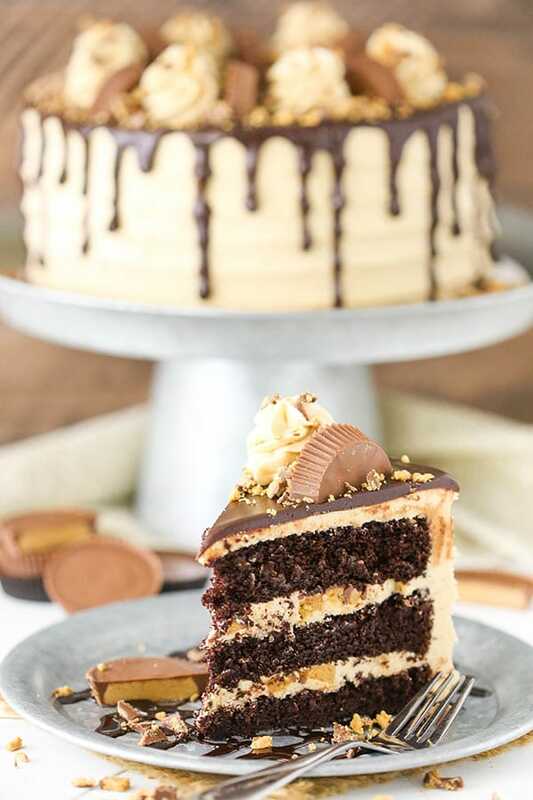 I used three 8 inch pans, made a butter/cream cheese peanut butter frosting, topped it with a simple ganache and crushed Reese’s. I was a little concerned about the batter because it was so thin/runny but other people made comments that this was normal and didn’t effect the cake at all…and it didn’t. I’m so glad it was a hit! Thanks Kim! I want to make this cake for my boyfriend’s birthday coming up. 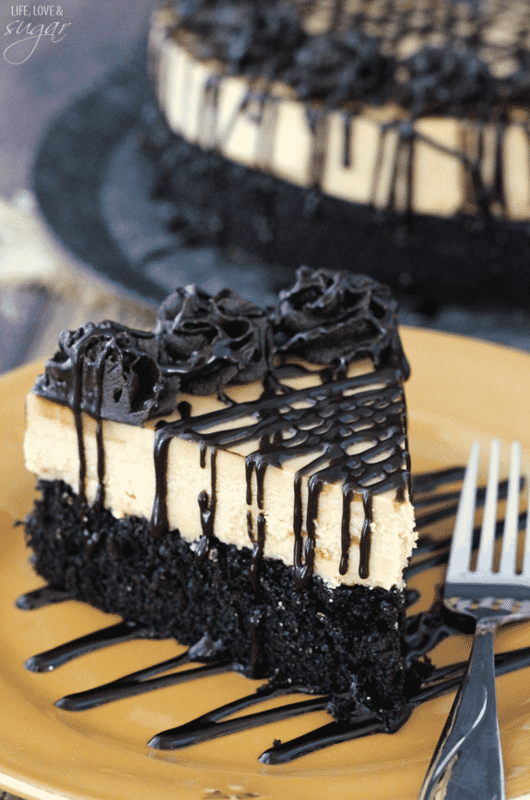 Is the peanut butter frosting recipe really sweet and peanut buttery? I’m not too crazy on peanut butter. I’d say it’s both sweet and full of peanut butter, though you could reduce the amount of peanut butter and sugar and it’d be fine. So I’m going to make this cake this weekend and I’m nervous about the chocolate ganache. 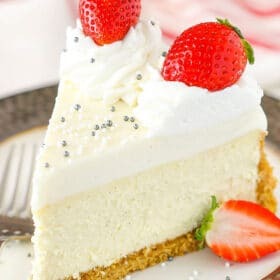 I’ve made it before and whenever I pour it in the cake it just runs down the sides and is super messy.. do you have any tips? I’m not sure what ganache you’ve made it the past, but it depends on the ratio of chocolate to cream. The ratio used here should give you a nice consistency to work with. You can let it cool a bit before using it too, to let it firm up a touch, if it seems like it needs it. Each pink recipe card has a print button within it so that you can print just the recipe. I hope that helps! The peanut butter chocolate layer cake was AMAZING! 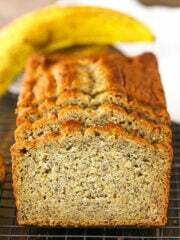 I bake ALOT and have tried many recipes, this one is definitely top of the list! I followed the recipe exactly and it came out perfect! Really delicious. Especially the frosting, it was perfect balance of peanut butter flavor but not too sweet. How thick do these cake layers bake ? I like thick layers – 2 inches or so. Should I multiply the recipe by 1.5 ? I’d say they’re roughly 1 1/2 inches per layer. You might want to do 1 1/2 worth. I am making this recipe now but I don’t have 8 inch pans. I am hoping two 9 inch will work. Fingers crossed. That should be fine, you just might need to adjust the baking time a bit. Worked great. I split the two layers into four. Baked for 35 min. The cake was a huge hit. My son was over the moon happy with it, even if I forgot the ganache! wish I could post a pic here of how it turned out. I’m so glad it was a hit! Thanks Karen! 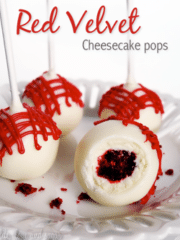 I made these tonight and used two 8″ X 1.5″ deep pans and it was really scary to watch them. I thought it was going to rise so much an spill. Didn’t happen. Domed a lot though but it was done in 25 minutes. I let the cakes stay in their pan in the oven for an extra 5. Then I used a clean towel to press the dome into the cake till it was leveled cos I want to make layer cakes and don’t want to have to cut off the dome. I hope that I’ll remain moist and fluffy when it is cut into. I intend to assemble the cake tomorrow. the layers out the pans in one piece. ever use a whole pound of butter and 2 pounds of powder sugar to frost one cake. Something is definitely wrong with this recipe or should many things are definitely wrong. Many people have made success with this cake, so it’s not the recipe. Did you line your cake pans with parchment paper? That’s a big help with making sure they don’t stick to the pan. Hi there! So I have to make this for about 40 people. Any suggestions on how to go about doing that?! Maybe use a 12 inch pan? Should I double or triple the recipe? It depends on how big of slices you plan on serving. A 12 inch should certainly be big enough. I’m not sure how much batter or baking time though. I haven’t ever made this cake that size. I’d guess you’ll need to triple it – or so. 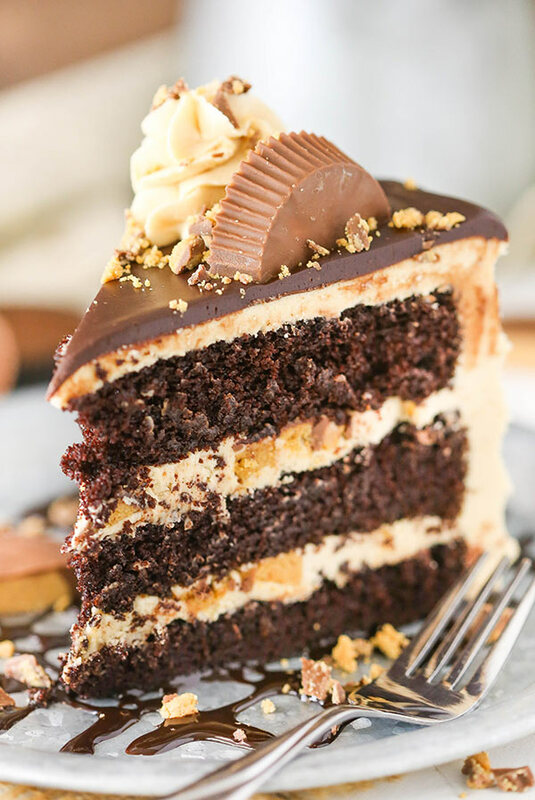 I just found your recipe for Peanut butter chocolate layer cake. 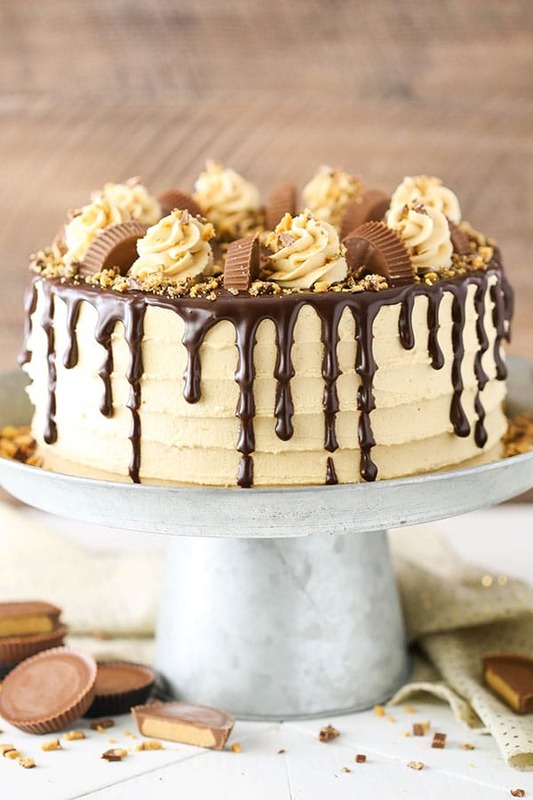 I want to make this for my hubby on Mon, I am not at all experienced with cake making, however your tutorial looks easy to follow and is causing me to drool just looking at your pictures. 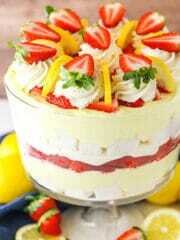 It is a beautiful looking cake. I am confused as to why I need 8 Reese’s cups cut in half though because your picture shows only 8 halfs (which would equal 4 whole peanut butter cups, 8 cut in half gives me 16 halfs)? Are you using the extra 8 half pieces and crumbling those up to put on top to finish the cake? I get that the 6 peanut butter cups are chopped up and half is put on the bottom layer and the remaining half goes on the second layer. So are the remaining halfs then chopped for on top? I don’t want to buy a bunch extra if I don’t need them, so if you can clarify I would appreciate it. Small detail, I know:) Thanks so much! Yes, the remaining cups were crumbled on top. You can leave off if you would like to. 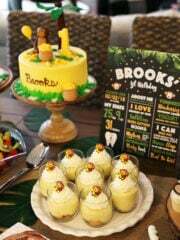 Hello, my grandson make this cake and it tastes really good. When he went to put the ganache the cake fell apart. Do you know what could have gone wrong? thanks. Do you mean the ganache that goes on the top of the cake? I’m not sure how that’d make the cake crumble? I am looking forward to making this cake and wanted to know if I could add coffee instead of the hot water for a mocha taste to the cake? You can add coffee, but it won’t really add a coffee flavor. It wouldn’t be strong enough. Most people add coffee to chocolate cakes to help enhance the chocolate flavor. You could try adding a few tablespoons of powdered espresso to the hot water and see if that would strong enough, but I’m not sure without trying it. First time ever making a cake not from a box. When you said parchment paper and spray which goes first? I add the spray, then parchment paper. But either way should be fine. Hi – Do you use a peanut butter with added sugar or a natural peanut butter without added sugar? I use smooth and creamy JIF. They were 8 inch pans. You could double the frosting, but it does already make quite a bit. Wow! This cake turned out fabulously. Tastes amazzzzzing! I’m not kidding one compliment I received was from a guy who said and I quote, “In 44 years of living this is the best cake I have ever had!” Not to mention how beyond gorgeous this was after decorating (simple steps but all together looked professionally done!) This cake will impress your guests and tastes incredible! Thank you thank you thank you!!! I have made this cake many times. It’s a definite crowd pleaser and my personal favorite cake of all time. I make cakes frequently…from wedding, to birthday, and beyond. This one takes the cake! ???? Awesome! So glad it’s a hit! Thanks Jamie! WOW!! This is gorgeous!! 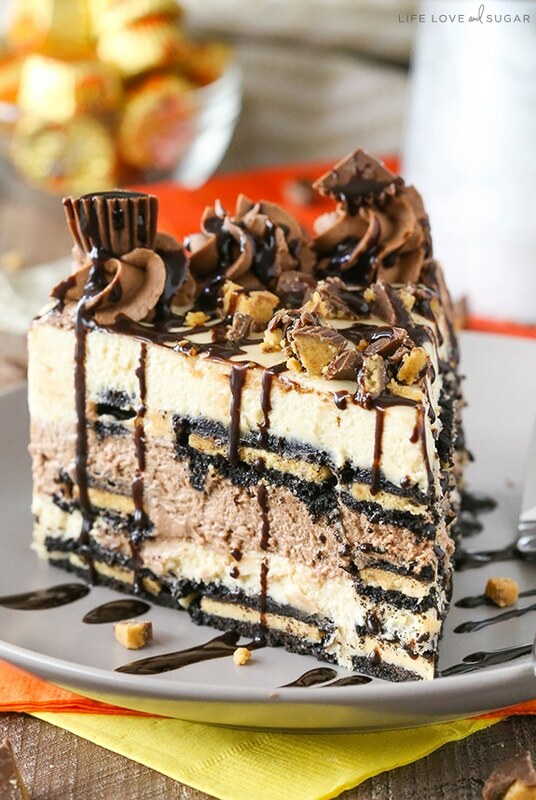 I’ve been looking for a cake that looks good and tastes good, and this cake looks to be both! I definitively have to try this! By the way, I think it’s great that you use scripture on your blog! Made this cake for a Women’s Banquet at our church and got so many compliments! I’m 14 and got asked by so many people of it was from one of our local bakery’s! 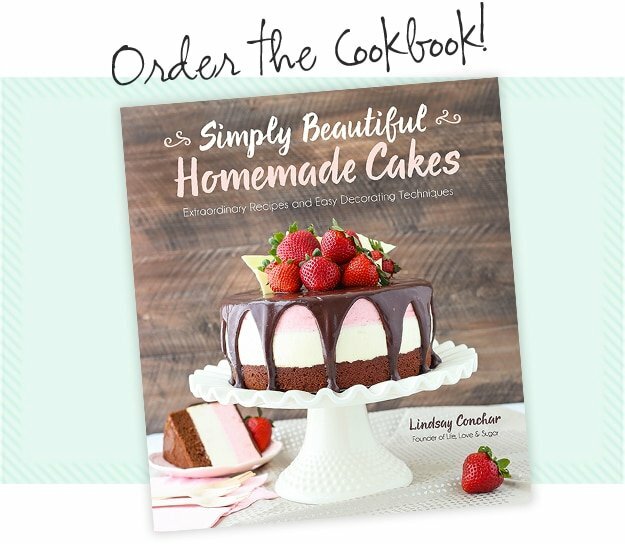 Super easy gorgeous delicious cake will definelty be trying more of your recipes!!! Wonderful! I’m so glad everyone enjoyed! I made this for my friend’s birthday! It was a huge hit! I used 7 cups of powdered sugar, instead of the recommended 9 cups because I wanted a stronger peanut butter flavor. Thanks for sharing! I’ll be using your butterscotch cake recipe and your chocolate cake recipe for my daughter’s birthday coming up! Wonderful! I’m so glad you are enjoying the recipes! It’s in the oven now.. only question. .. I have a 10inch cake pan, & poured all of it in there. What would be the recommended cooking time? I haven’t tired a 10 inch pan so I’m not really sure. I made this cake for my husband’s birthday tow weeks ago. Which pan size did you use? 9 inch? I used 8 inch pans. Delicious cake! The birthday guy asked for a peanut butter and chocolate creation and this made for the perfect dessert! With the ganache on it, I might refrigerate it overnight and let it come to room temperature before serving. What a perfectly cake! Looks delicious; I’ll be making this for my husband’s birthday. He will love it!